It's important to me that I teach my children to recognize that they each have their own moral compass, an innate sense of right and wrong, and that they know how to tune into it. I want them to believe in their ability to trust their instincts and navigate situations in ways that are right for them. They are learning, and will continue to learn, that their safety and well-being always comes before the the request of another person- peer or adult. If a teacher, coach- anyone- asks them to do something that doesn't feel right to them, for whatever reason, they forever have the right to say no and remove themselves from the environment if need be. Holding a position of power does not, in any way, qualify a person to receive complete respect and unquestioning obedience. I believe this to be a precaution against abuse I hope will never occur, yes, but I also believe in empowering them to hold their ground and stand for what they personally believe to be right, taking action simply because it's ethically sound. Demanding obedience for the sake of obedience will not get them there. As their mother, I know that I can't expect them to do everything I say. Of course, they hold my hand in parking lots, practice good hygiene, and eat a diet that supports their nutritional needs. They're also 5, 3, and 2. As they grow older, I'm not always going to know what's best for them. I can give them my most sage advice, a sincere example, and endless support, but I can't make their decisions for them; I won't. I'm currently guiding and teaching them, honing in on their strengths, but they each have a path all their own. It won't be long before they are the sole navigators. They need to be able to trust their instinct as it relates to their vision of who they want to be and what they want to contribute. 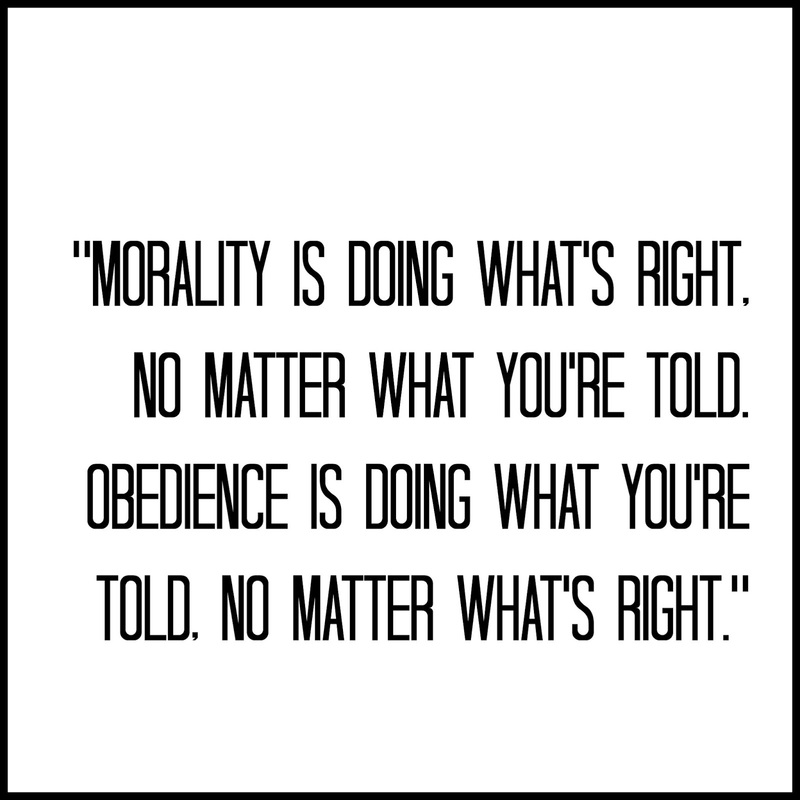 I came across a quote recently, to the effect of, Morality is doing what's right, no matter what you're told. Obedience is doing what you're told, no matter what's right. I want my children to desire, as well as to emulate, truth and goodness because they believe it to be the right thing to do. As applicable as I find it to raising children, I find it every bit as applicable to myself, if not more. I try to do what is good and right because I know it's the right thing to do. I can improve in so many ways, and I am actively seeking out those areas rather than waiting to be told. If we wait to be told to do what is right, we miss opportunities to do so much good. If we wait to be told to do what is right, we are silencing our inner voice that knows what is right. If we wait to be told to do what is right, we are no longer thinking for ourselves. If we wait to be told to do what is right, we are acting out of obedience rather than morality. 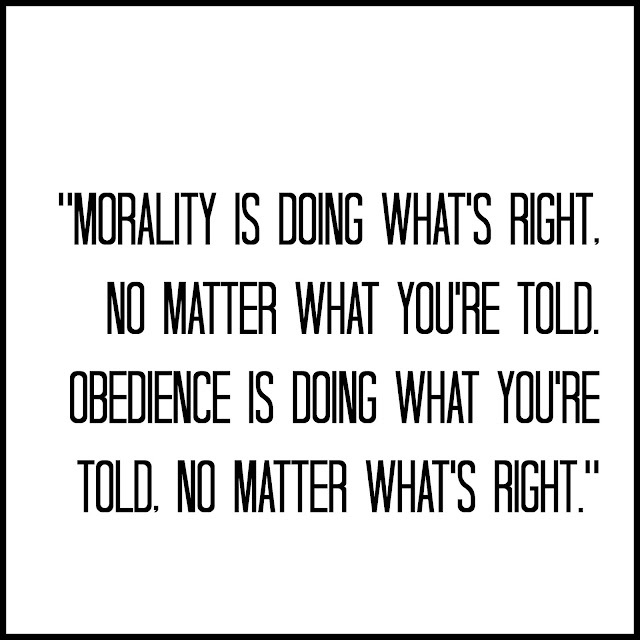 I don't believe that obedience and morality are necessarily mutually exclusive. It is possible that we can be guided and instructed by those in positions of power to do what is right, but it's problematic to rely completely on their instruction and timing, because it's possible it might never come. It's equally problematic to act in obedience when something doesn't seem right, just because we were told to do so. It's wise to put our trust in those who will guide us toward what is good and true. It's wiser still to trust in our ability to seek out and act upon what is right, no matter what.